Every year in the US, one third of people over the age of 65 experience a fall. Falls are the leading cause of emergency room visits, representing 20% of admissions. 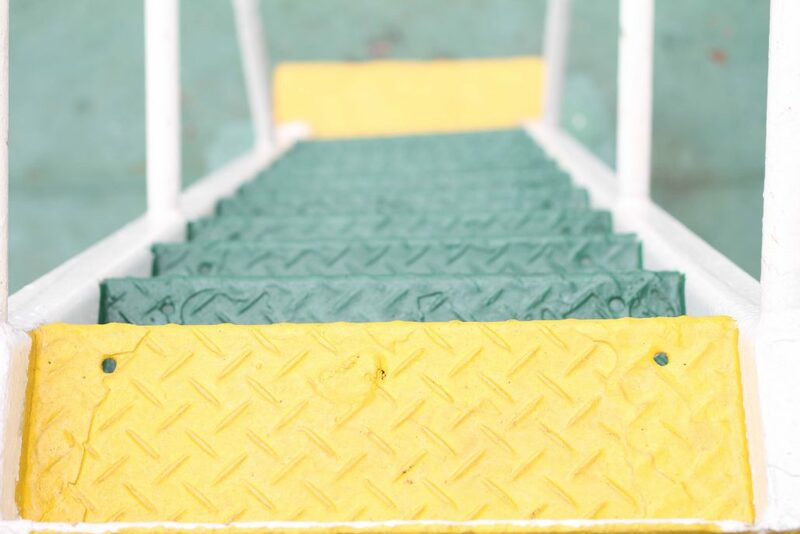 Metal stairs, floors, and ramps are a known slip and fall risk, especially when wet. But there are more metal surfaces that can also be dangerous due to their slipperiness; tools, handrails, and door handles can cause accidents when they slip out of hands. Fortunately, anti slip paint for metal surfaces(also non skid paint for metal) is formulated to be suitable for any setting, and any metal substrate. Here we will look at the various applications of anti slip paint for metal, from residential to industrial, as well as outlining the products available on the US market. Increasing surface friction decreases slips and falls. The slip resistance of a metal surface – whether it is stairs, floors, handrails, or ramps – can be increased through the application of a coating. These coatings can be applied in two ways: through the addition of an anti slip aggregate to a paint, or by using a paint which already includes aggregate or which results in a rough-textured surface once dried. What it is: Anti slip properties are given to a coating by adding an aggregate such as sand, glass beads, rubber crumb, and others. The aggregate provides a rough surface which prevents slipping. Aggregate can be mixed through a coating before application, or sprinkled over a still wet first coat. If the second, it should be allowed to dry before having excess aggregate brushed away and a second coat applied on top. The aggregate comes in three grades: fine, medium, and coarse, in order of increasing anti slip strength. Recommended for: From heavy industrial-use flooring to kitchen floors, aggregate is a flexible material. 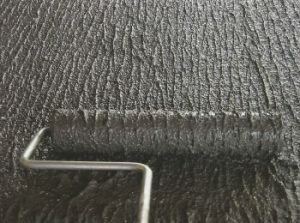 However, which aggregate you choose will affect which coating you can use: glass beads and synthetic aggregate can be combined with acrylic coatings as well as resin coatings (epoxy, urethane, polyaspartic and polyurea), whereas silica sand, aluminium oxide, coloured quartz and flint silica aggregates can only be used with resin coatings. Another benefit to adding your own aggregate is that it gives you control over the result. The bigger aggregates are not recommended for use with non slip paint for metal stairs. For , you can purchase paint with aggregates already mixed into them, or paints which dry in such a way that their surface is non slip. What it is: The simplest of the anti slip paints, these products come with aggregate pre-mixed, either as a two- or single-component system, or create a rough textured surface as the coating dries. These coatings are durable, water and oil resistant, and come in epoxy, polyurethane varieties. They are often divided into categories based on specific need; Offshore (corrosion resistant anti slip paint for metal), Industrial (chemical and abrasion resistant coatings) and Commercial (aesthetically appealing non slip coatings). Recommended for: Substrates that require less aggressive non slip qualities; interior and exterior floors, walkways, mild industrial and commercial environments with up to heavy pedestrian foot traffic and light rubber wheeled cart traffic. Hospitals, kitchens, change rooms, schools, anywhere that requires a slip-protection coating. There are non slip paint for metal manufacturers and contractors across the US. Below is a table outlining different non slip paint products, as well their use and prices. If you would like any more information about anti slip coating for your project, or would like to be connected with one of our partners, get in touch! Our experts are here to help. Use the “Request a quote” button at the bottom of the article and take advantage of our 100% free service.